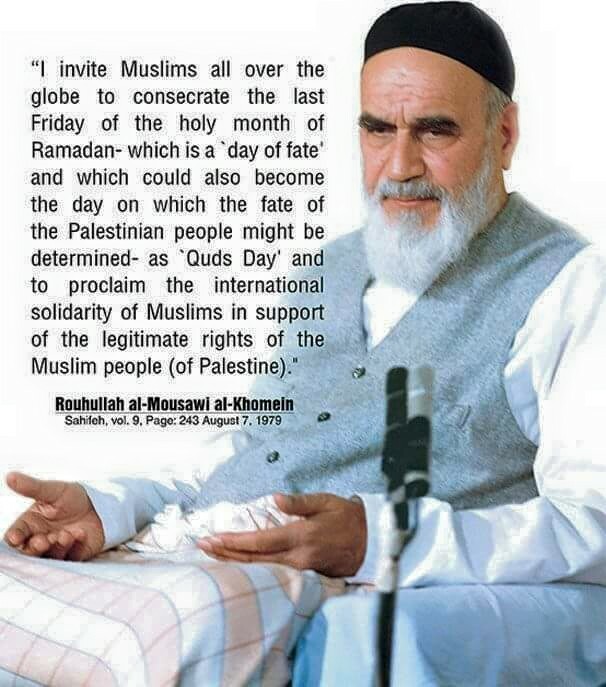 The gentlemen must pay attention, all the Muslims must pay attention, Quds Day is a day to which all the Islamic nations together must direct their attention and keep alive. If a hullabaloo is raised by all the Muslim nations on the last Friday of the holy month (of Ramadan), which is Quds Day, if all the people rise up, if they stage demonstrations and hold marches as they are doing now, this will be the beginning, God willing, of our stopping these corrupt elements and kicking them out of Islamic lands. But we are apathetic, the Muslims are apathetic, the people remain unwilling to take a stand, they seldom rise up or hold demonstrations about this affair. When Israel saw that the nations are at variance with one another, that the Egyptian government is its companion, its brother, and Iraq too is its brother, it advanced step by step. And you can be sure that if you remain apathetic then it will try to reach the Euphrates, for the Zionists claim that all of the land up to the Euphrates belongs to them. You must take a firm stand against them. And if it happens that the Muslim nations take a firm stand against the Zionists but their governments oppose them in this, then they should hit them in the mouth just as the Iranian people hit Muhammad Riza in the mouth. Muhammad Riza was stronger than any of the Muslim governments and enjoyed more (international) support than any of them, nevertheless, our nation rose up, made Islam their objective and shouting Allahu Akbar (God is the Greater), destroyed this and other powers. Even if all the powers came together, they would still never be able to hurt such a nation. Imam’s remarks dated 6 August 1979 (15 Murdad 1358 AHS). Sahifa-yi Nur, Vol. 12, p. 275. Navy set to defend Iran interests: Cmdr.